While we were all drinking rosé and toasting to the long weekend, Martha Stewart was doing something far more wholesome: gardening. The home and cooking icon spent Memorial Day planting the terrace gardens at her house in Maine, which she says is an annual tradition with close friends. "It's quite an undertaking, but I always enjoy the time, especially with the group that accompanies me from year to year. As soon as I get there, I design the layout of where things should go, and then we all get to work." 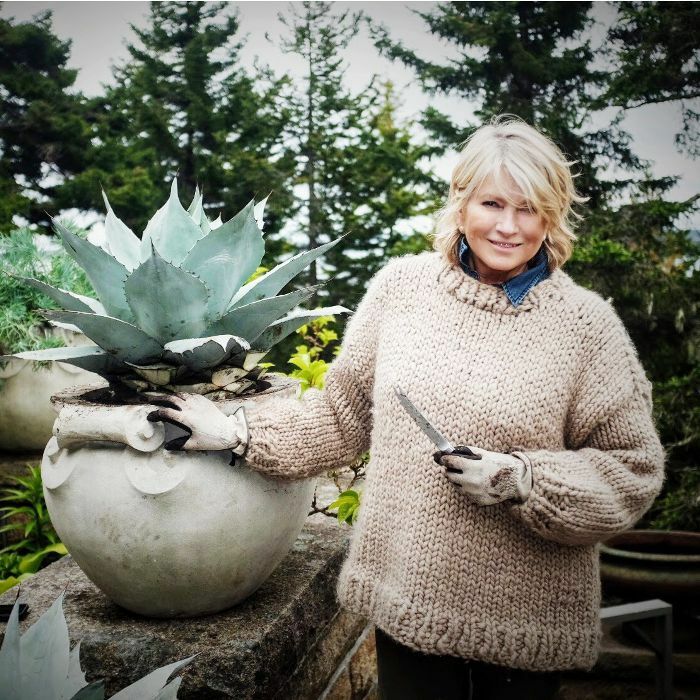 Stewart recently shared personal photographs of the garden on her blog, Martha Up Close and Personal, and shared details about the plants and urns she's opted for this year. Take a look at her gorgeous Maine garden and find out more about the seven plants she's handpicked for the space. Stewart's home is encased in kiwi vines. "This vine should be planted in well-drained soil. Kiwi vines can tolerate a lot of different light conditions, but more exposure to sun brings out better colors in the leaves, some of which can be variegated," she writes on her blog. "On both sides of the planter, my glazed terra-cotta sphinxes watching over the terrace. These sphinxes were designed by Emile Muller." "A few years ago, we created this peaceful sitting area on the terrace with the faux bois bench and these Gertrude Jekyll-style pots," she says. " In the bed, wild ginger and hosta are thriving." "Agaves are exotic, deer-resistant, drought-tolerant plants. Agaves make wonderful container plants. We also planted Senecio, a genus of the daisy family that includes ragworts and groundsels." "This is the stone trough I bought at Trade Secrets several years ago. This year, I wanted it planted in [succulent] color blocks with pink gravel—the same pink gravel that covers the carriage roads at Skylands." "On this wall of the western terrace, we planted three Soderholtz pots. Every year, I select different types of plants and try to vary where they are planted. Each of these three pots contains a variety of begonia, palms, and baby's tears," she says. "Ferns can add dramatic beauty to any planter. In general, ferns are low-maintenance, hardy plants. They require lots of shade and ambient sunlight." "Here is a beautiful large palm. The small one behind it is a cedar I recently purchased at Trade Secrets," Stewart shares. Are you planting out your garden this spring? Tell us which varieties you've chosen.